Never failing to deliver a stellar line up of genre pushing, ground breaking bands at the forefront of the hard-hitting music scene, Avocado Booking are excited to present their heaviest line up yet for the Impericon Never Say Die Tour 2016. Now in it's tenth year, the festival continues to go from strength to strength serving as a benchmark for the heavy music scene worldwide. With five genre-redefining albums to their name, WHITECHAPEL have carved themselves a unique niche in contemporary metal, and in doing so have gained legions of fans. Their reputation for maintaining their integrity is well earned, and going into their sixth full-length this commitment is stronger than ever. "We are excited to return to Europe this fall with our new record and headline Never Say Die! 2016. We love Impericon and the Never Say Die! Tour so we've been looking forward to this since it was offered to us. The line up is solid and heavy so don't miss this tour!" says Alex Wade from WHITECHAPEL. 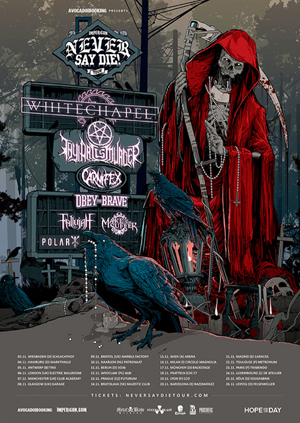 Also on board for the tour are THY ART IS MURDER, CARNIFEX, OBEY THE BRAVE, FALLUJAH, MAKE THEM SUFFER and POLAR. On June 24th, WHITECHAPEL will release their sixth full-length album, Mark Of The Blade, worldwide via Metal Blade Records. Pushing their sound forward with each successive release, Mark Of The Blade remains true to the band's roots while venturing into previously unexplored territory, both sonically and lyrically. Pre-orders are available at Metal Blade.